This week’s #FridayFinds focuses on the importance of creating the ideal online customer experience. What is important to your customers? This article highlights some of the statistics gathered in a LivePerson.com survey of nearly 6,000 consumers. Also featured, is an article on TheRealTimeReport.com that discusses live chat software with a focus on Chatwing. My last fun find showcases 40 minimalistic logo designs that could get you thinking differently about how effectively a simple logo can communicate a brand. How do you satisfy the needs of your online customers? What do consumers look for in an ideal customer experience? 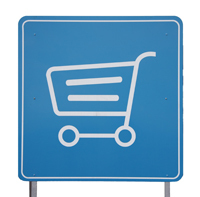 Could offering online chat mean the difference between a sale and another abandoned shopping cart? 82% of the consumers surveyed found getting an issue resolved quickly was critical. 56% found having their issue resolved in a single interaction is key. 71% of visitors expect to be able to access help within five minutes (81% in the US). 48% of consumers will abandon their purchase if they don’t receive help within their expected time-frame. 57% of consumers expressed an interest in live chat. 34% of consumers are interested in click-to-call. Note: This survey was conducted across the US, UK, Australia, Germany, France and Italy on the “ideal online experience”. If you’re interested in adding live chat to your website, check out Chatwing: Free Live Chat Tool Adds Realtime, Social Interaction To Web Sites by Vincent Nguyen. Vincent highlights some of the advantages of adding the Chatwing widget (and how easy it is to add it to your website). He also introduces you to two other alternatives. This week’s fun find is 40 Clever Minimal Logo Designs on InspirationFeed.com. Some of these logos are so simple yet they communicate the brand so well. In my websites I tried using live chat but it never working.So for time time Iam not using it.In my opinion it may take some time time for my country people to get used to it.Visitors respond very well to submit forms,but again the question of spamming come to picture.Its better to put your contact number as people now are in lot of hurry and need immediate answer to their queries. I used to use live chat on another site and very few people used to use it. I liked the fact that it was another way for someone to send me an email. (If I wasn’t online, that option would pop up.) That program also had the ability to know when someone was on and when they left. So, that was interesting too but if that site had received a lot of traffic, I would have turned that feature off. That’s good that your visitors respond well to forms. We need to offer multiple ways to contact us. People like different methods of communicating. Thanks so much for taking the tie to share your thoughts with us. Funny how they call those logos (which are great designs, in my opinion) “minimal.” I doubt the time it took the designers to produce them was minimal. I have great admiration for a well-done, fitting logo. Adding a Live chat system to your website may sound good but sometimes it makes problems as well for certain business types, specially when you have different location business establishments. Certainly it is tough to answer questions immediately and if you can’t answer your site visitor’s questions then most probably he/she won’t come to your site again or they may not visit your store physically. Live chat system is perfect for those who are operating from a single location with a minimum service & product lists. Yes I do add Meebo live chat to one of my client’s restaurant website. But he could not manage the system and we removed it from the site. They have restaurants in different cities and site visitors used to ask for table booking, availability of certain dishes, parking availability etc. Thanks for sharing your insight with us Raboken. I can understand how a live chat could be unwieldy for a restaurant. My experience with live chat software was years ago and it was not a very high traffic site. So, I had no problems dealing with the requests that I got. (There really weren’t that many.) I did notice that I received more emails from the away message (from the chat software) than I did from the contact form I had on my site. The number one way to contact me was by far the toll-free phone number that I had. I use live chat on my website. Basically you get a pop up window that someone is online. You need to stop what you are doing and answer immediately. The conversion rate of live chat to sales is poor. Many of the questions that are asked can’t always be answered immediately. Example is a particular item in stock. They may ask if I can price match. The girls need to get my permission. I put it on my site as I thought it would help with simple questions. It does that, but I feel you lose the personal contact to be able to convert that customer. Having to put logos into print it is important to remember that usually the first color of the logo is included and each additional color requires another setup and run charge. Google is a prime example. Their logo is simple, but it is a six color imprint, even though the color blue and red is used twice. So it is not only the simplicity of the logo, try to keep the colors of the logo to a minimum. I think that some people simply prefer to chat online as opposed to calling on the phone. So, for them, offering online chat makes sense. I can understand how price matching would be an issue but if you have a standard answer for your associates to give (including something like we will get back to you within 1 business day), I would think that would be acceptable for most customers. You’re absolutely right about the cost of additional colors. I learned a clever trick on logos from a graphic designer who I worked with. Our business card was 2 colors and I assumed that the text would be in black. By printing the text in a darker shade of one of the main colors, we were able to cut costs significantly. No surprise I like many of the logos and their simplicity Sherryl. Also agree with you about the need for a good graphic designer as they know how to capture the essence of the brand. This takes skill and experience and not just the ability to use software. Once I had a logo developed for an analgesic and they combined the colour red which portrayed strong but they feathered the logo at the bottom which conveyed relief which consumers easily identified with. My experience with a graphic designer (for a photography business that we had) was so positive. What you said about capturing the essence of the brand is essential. Graphic design is a real skill. I will definitely second that Sherryl! I want my question answered quickly and then I’m gone and happy. You might have heard about my internet fiasco this past week where it went out every single day and the customer service people could not tell me what the heck is going on. How can that be! It was five days in a row and the first day was out over 24 hours. Urgggg! We just want a quick answer and if there isn’t anything I can do then tell me. I’ve never used live chat because I prefer to talk to a human being and not wait on a response. Those logo designs are pretty cool, great share girl. Thanks for these and enjoy the upcoming week. I can’t remember if I replied to your thread when I read about your experience Adrienne. (If I remember correctly, it was on Facebook.) By the time I would have joined the conversation, I think all I would have added would have been a vent about Comcast. (I personally have only had positive experiences with AT&T). It’s good that using Twitter worked for you. Thanks for letting me know you liked the logos. The minute I saw that post, I knew I was going to include it. Thanks for dropping by. You enjoy your week too! Interesting report. Will print and read it. What they say makes sense. Have considered installing live chat on my Swedish website but am not sure it’s such a good idea since you have to answer them immediately. What if you are in a meeting? :-) And I don’t see the need for visitors to chat with each other. When it comes to logos they have to be simple. Far too many companies come up with cluttered logos that on top of it don’t make it clear what the company is doing. Catarina recently posted..Would you survive a scandal? I’ve used live chat before and they have an away message that you can set up. I think the real value in installing these types of systems is if you’re selling something with a buy-now option. If a person is ready to make a purchase, having the ability to answer any questions immediately can make a difference. I’m not sure how much value there would be in you or I adding it to our blogs. I think a better fit for us may be the software that allows someone to leave a voice mail rather than having to fill out a contact form. Sherryl — I have not installed a live chat feature on my website and don’t plan to because I have a limited number of clients who can simply email me or pick up the phone. A while back a guest blogger wrote a post on my site about how to enable a member on LinkedIn to engage in a live chat with a customer service rep of your company. Here is the post link writespeaksell.com/generate-live-leads-through-linkedin. You can use one of the 3 websites you’re allowed to link to in your contact information. I read Andrew’s guest post and I think his idea of using one of the links on your LinkedIn profile to add an application or a service is great. I’ll need to keep that in mind for the future. Thanks for sharing it. As simple as those logos look, I recognize how much work has gone on behind the scenes. A good graphic designer works with their clients to convey their brand. It does not just happen. Thanks for taking the time to drop by and start off the conversation!